For these pretty earrings, I hand beaded silver and translucent blue glass seed beads into a small geometric diamond shape. I love wearing this style of earrings because they are so lightweight. They also come in a black and silver version. 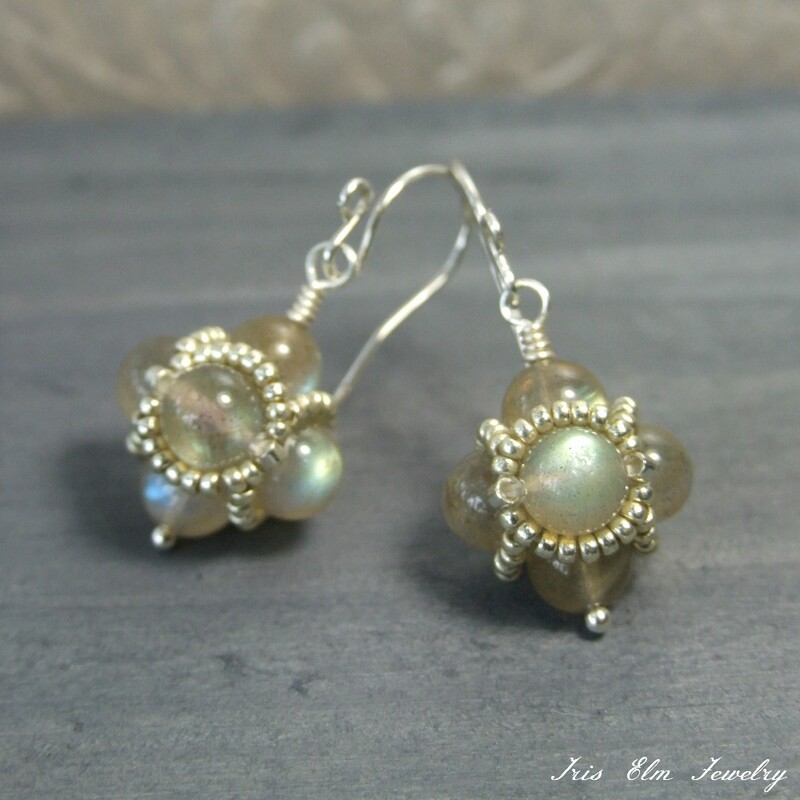 These uniquely beaded earrings are a re-addition to my shop. 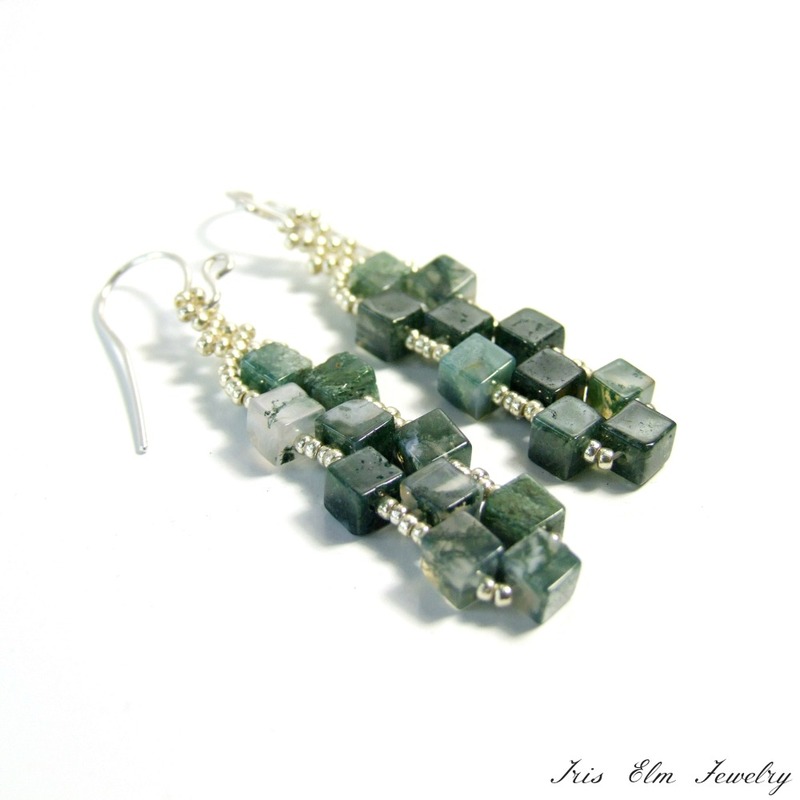 They are beaded with cube shaped moss agate gemstones that appear almost as if moss were frozen inside the stones. They dangle from my handcrafted sterling silver ear wires. These delicate and modern dangle earrings feature square iridescent labradorite and faceted garnet gemstones that are wire-wrapped with sterling silver beads. Beneath the gems, I added a tassel of sterling silver chains. Lustrous tiger eye gemstones are surrounded by bronze toned glass beadwork for these small boho dangle earrings. They hang from handcrafted 14k gold-filled ear wires. I found these labradorite beads at a local store and had to have them since that is always my reaction whenever I see anything labradorite. They have a beautiful iridescent shimmer with lots of green and blue flash. I beaded the gemstones with tiny glass seed beads to create these small and unique drop earrings.